Get ready for a master class in stop-motion animation taught by Christopher Nolan. After announcing that Nolan's new short documentary about American animators the Quay Brothers would be premiering in New York City this August, Zeitgeist Films has followed up with a 11-city tour. 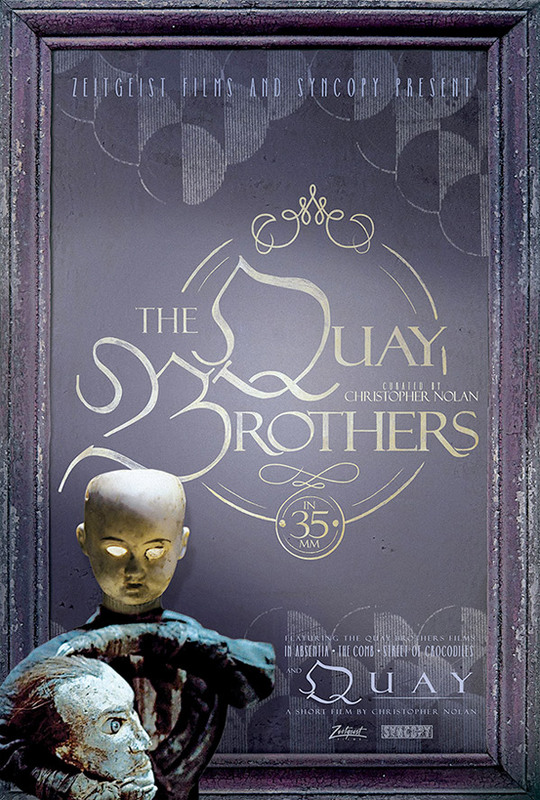 The screening series will stop at various locations in North America, showing three Quay Brothers films plus Nolan's new doc in 35mm. Along with the news that it might be coming your way sooner than you thought (though everything will be available on Blu-ray this fall), the first teaser trailer has debuted and it's a quick introduction to the Quay Brothers and their animation. This looks like it may be worth your time and money to see in cinemas. The screening series will kick off on August 20th at Film Forum in New York City. Introducing the Quay Brothers: "American identical twins working in London, stop motion animators Stephen and Timothy Quay (born 1947 in Norristown, Pennsylvania) find their inspiration in Eastern European literature and classical music and art, their work distinguished by its dark humor and an uncanny feeling for color and texture." So far they've made a number of shorts and other animated specials, including the three mentioned which will be screened: In Absentia (2000), The Comb (1991), and Street of Crocodiles (1986). The tour will then continue through 11 cities (so far), including Toronto, Detroit, Seattle, Austin, Houston, Los Angeles and Chicago. For more details on the 35mm tour, including screening locations, visit zeitgeistfilms.com. Great! I'll actually be able to see this. I can't wait. I sure hope this means a future blu-ray release is in store for this. Fingers are crossed. Seems great. Guillermo Del Toro loves these guys, I bet. Anything Nolan touches is over hyped nonsense. Horrible writing written for teenagers. The Quay Brothers are hardly over hyped nonsense. They've been around making amazing animations since the 70's. They have influenced pretty much anyone who have seen their work. But looking at a poster's history can sure tell a lot about someone and after seeing yours, I'm wasting my time.